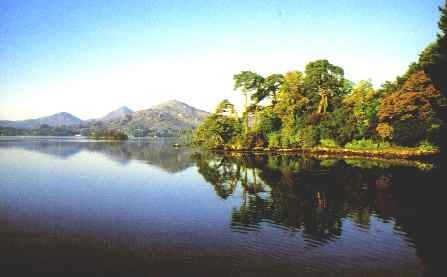 Glengarriff which derived its name from 'An GleannGarbh' - the rugged glen is one of Ireland's most beautifully situated villages, nestling at the foot of the Caha mountains. The Forest Park on the N71 Kenmare Road is well worth a visit, as it is one of the few remaining examples in Ireland of the original Oak and Holly Woodland that once covered the country. There are a number of nature trails through the forest together with delightful picnic areas. A short trip across the harbour brings the visitor to Ilnacullen (island of Holly)- the famed Garinish Island with its 37 acres of sub-tropical plants and Martello Tower. 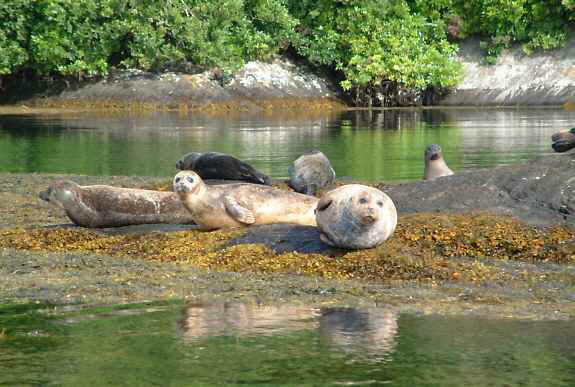 The surrounding waters are quite rich in wildlife, and seals can frequently be seen the rocks on the southern shore. Leaving Bantry via Kealkil and driving through the Pass of Keimaneigh lies Gougane Barra where the river Lee has its sources. It is surrounded on three sides by mountains and the fourth side opens up to the River Valley. 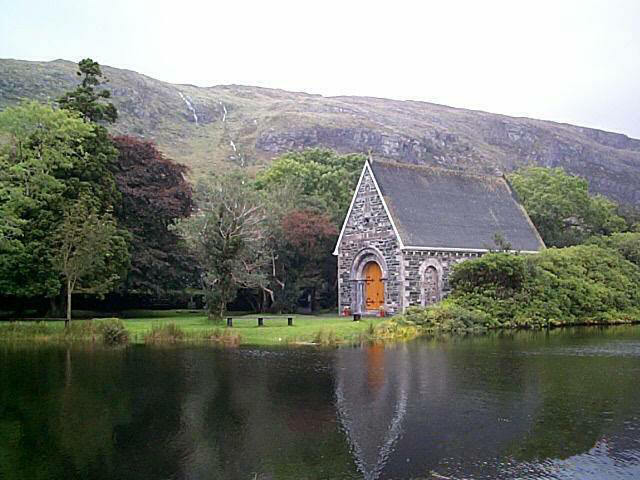 It was here in Gougane Barra that St. Finbarr, Patron Saint of Cork, founded his monastery. 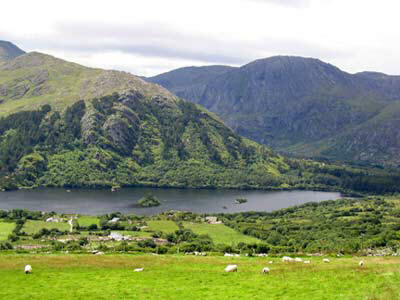 Ireland's first National Park with its nature trails and picnic sites was opened in Gougane Barra. An ideal place to relax and unwind. Driving out of Bantry by one of the roads to the east one encounters Lough Bofinne, one of the famous trout fishing lakes of Ireland. Four miles further on, the ruins of O'Donovan Castle is encountered as well as the famous mound of rocks signifying the tribal seat. By taking the road to the north past the Castle one enters the Mealagh Valley noted for its concentration of megalithic monuments. The road down the Sheep's Head Peninsula heads from Durrus village along the coast to the wooded inlet of Ahakista. Here you will see the Air India Memorial which commemorates the loss of an Air India Aircraft and the passengers and crew who were killed when the aircraft crashed off the Cork coast in 1985. Continue on to Kilcrohane. Beyond the village the road climbs adventurously to the top of Sheep's Head, on the ridge of which is an old signal tower. 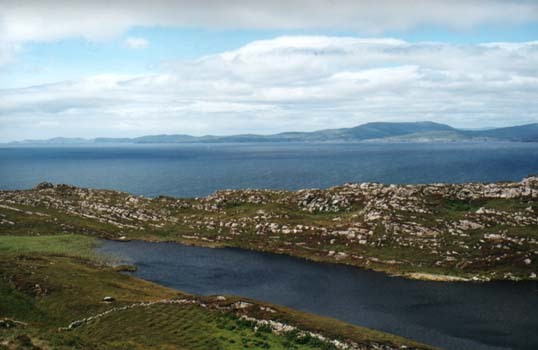 A return is made via Kilcrohane and the north side of the peninsula by way of the mountain road called the Goat's Path where the wide expanse of Bantry Bay, Bere Island, Hungry Hill and Sugarloaf Mountain can be viewed. Journeying through Coomhola (Rushing Water) and the breathtaking Borlin Valley to the source of the cascading river one can enjoy the splendour of the hidden valleys of the Southwest. From the Pass to the North one encounters the tunnel, remains of monastic settlement, battle site of Callan (1200's) and the vintage car museum before arriving at Kilorglin. Passing through Kenmare and returning to Glengarriff one has to negotiate the famous winding tunnel road with panoramic views of Glengarriff Woods and the upper Bay Region. 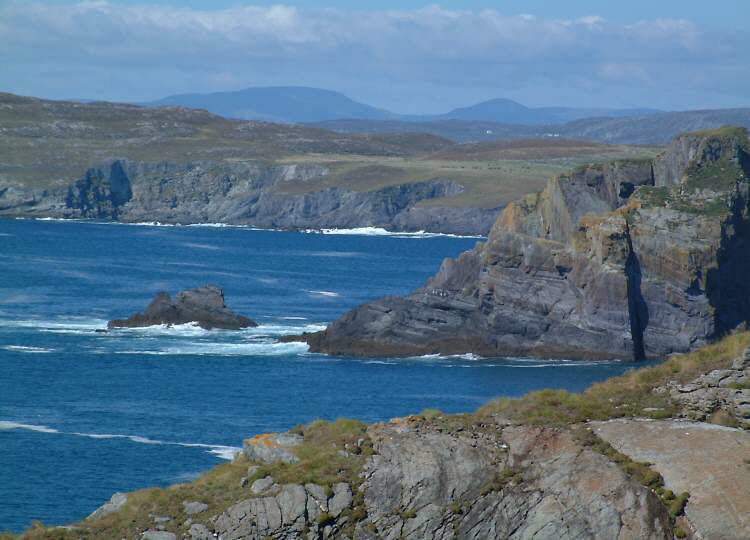 Mizen Head, with almost vertical cliffs and a lighthouse station on an islet linked to the mainland by a suspension bridge, is the extreme south western tip of Ireland. Here in the Mizen Vision one can see on display the fascinating story of the building of the Fastnet lighthouse plus the Keepers kitchen and bedroom which have been retained to recall the lifestyle of the men of the Irish Lights. The rest of the light keepers rooms have been converted to include an audiovisual room, a map and archive room, an underwater room, a bird and sea watch room, and a storm room. Close to the Mizen are the beautiful sandy beaches of Barley Cove. 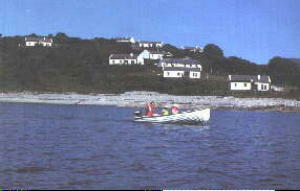 Nearby is Crookhaven, which has a harbour much favoured by yachtsmen. On the return journey, you pass through the delightful village of Schull which nestles at the foot of Mount. Gabriel which rises to just over 407 meters and has an aircraft tracking station on its summit. Finally, on to the brightly painted village of Ballydehob on the homeward journey to Bantry. The circuit of the Beara Peninsula is a wild and beautiful area, with high rugged mountains contrasting with the highly indented coastline. Castletownbere, the principal town, boasts the second largest natural harbour in the world and is the major fishing port of Ireland. Outside the town are the ruins of O'Sullivans Dunboy Castle and the remains of Puxley's Hall. Part of the local Community College, this is the only Planetarium in the Republic of Ireland and provides a unique educational resource. On the Planetarium's 8 metre dome, the Carl Zeiss single sphere sky projector shows an accurate representation of the night sky from anywhere in the northern hemisphere. In the bustling town of Skibereen are the Lough Hyne Interpretative Centre and The Great Famine Commeration Exhibition. The Great Famine Commeration Exhibition is a compelling reminder of the horrors of the terrible famine years 1845-1848 chillingly brought to life in a series of exhibits, dramatisations and interactive stations. 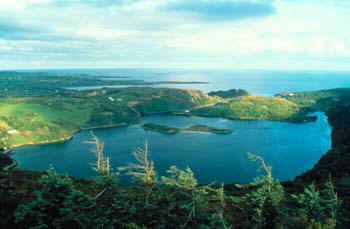 The Lough Hyne Interpretative Centre shows the variety of unusual sea life to be found in the waters of the Lough. Dursey Island is well worth a visit, whereby access to the mainland is by cable car, the only one of its kind in the country. En route you pass through Allihies which was once the site of extensive copper mines and then on to the colourful village of Eyeries where the file 'The Purple Taxi' was shot in 1975. A shorter trip through the scenic Healy Pass, Lauragh and the coast road of Kilmakilloge is well worth a visit.